The United States Congress designated the Table Rock Wilderness (map) in 1984 and it now has a total of 5,784 acres. All of this wilderness is located in Oregon and is managed by the Bureau of Land Management. A remnant of a lava flow that once covered this region along the western foothills of the Cascades, the "fortress" of Table Rock rises from a low point of 1,270 feet to 4,881 feet above the northeastern portion of this small Wilderness. On this steep and rugged terrain you'll find a quiet forest of Douglas fir and western hemlock, with noble fir at higher elevations and crowds of rhododendron on many of the upper slopes, an island of old growth in an ocean of forest development. At least two endangered plants bloom here: Oregon sullivantia and Gorman's aster. Deer and elk wander about in winter, and the northern spotted owl has been spotted among the old trees. From four trailheads, about 17 miles of trails give access to the Wilderness. A relatively easy hike from Table Rock Road will take you up the Table Rock Trail to the sweeping vista from the summit of Table Rock, where the land falls suddenly away in basalt cliffs on the north face. From this high point, Mount Rainier looms far to the north, Bull of the Woods Wilderness beckons from the east, and the Willamette Valley spreads out to the south. You will not find any reliable sources of potable water on the trails, so pack along your own. Horses may find dangerous footing on some of the talus slopes. 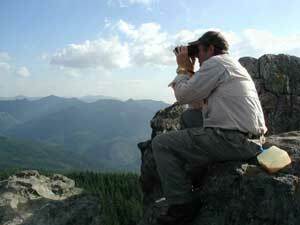 Planning to Visit the Table Rock Wilderness? How to follow the seven standard Leave No Trace principles differs in different parts of the country (desert vs. Rocky Mountains). Click on any of the principles listed below to learn more about how they apply in the Table Rock Wilderness.